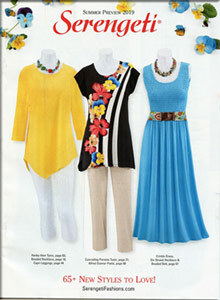 The Serengeti catalog knows how to dress plus size and misses sized women effortlessly in attractive casual wear from women's pant sets to skirt sets, dresses, knit tops, capri pant sets, vests and more clothing pieces featuring vibrant colors and patterns and comfortably relaxed fits. Women's plus size and misses clothing - Fill your closet with Fashion Favorites from the Serengeti catalog that are always the perfect fit, no matter what the season is. From Fall Harvest Fairs and Winter Wonderlands to Spring, Summer and Sea clothing collections, you'll enjoy a seasonal selection of tops, dresses, women's pant sets, outerwear and fashionable apparel available in plus and misses sizes to enjoy for year round comfort and style! Plus and misses women's pant sets - Take the guesswork out of putting together attractive looks with ready to wear women's pant sets, capri pant sets and short sets that are already mixed and matched just for you, so you'll always have the perfect ensemble! Choose from denim pant sets that are always in style, layer with textured three-piece pant sets or enjoy warmer days with tropical short sets, plus even more casual and chic pant sets for women! Plus and misses tees and sweatshirts - Whether you're crazy about cats, florals, birds, butterflies or ladybugs, you'll find a delightful collection of themed tees and sweatshirts featuring your favorite nature or animal themed designs! Choose from cropped fleece sweatshirts, cozy French terry cardigans, patterned tee shirts, sweatshirts and hoodies that go with a great pair of jeans or your women's pant sets for a lovely layered look! Serengeti Exclusives - When you're dressed exclusively in Serengeti, you'll never look better. Choose from Serengeti Exclusives including romantic floral garden dresses, twill jumpers, embroidered women's pant sets, three piece crinkle skirt sets, animal sprint short pant sets for women, and other plus or misses sized outfits. Then accessorize with select jewelry, bag and belts, hats, scarves and wraps to add a finishing touch to your exclusive Serengeti look! Explore the Serengeti catalog Casual Collection of fashionable women's clothing featuring exclusive women's styles in plus sizes and misses sizes. When your wardrobe calls for spring dresses, fall and winter outerwear or breezy women's pant sets and capri pant sets for the summer, the Serengeti catalog complements your wardrobe piece by piece.